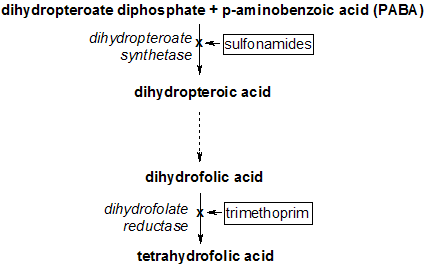 Trimethoprim acts by interfering with the action of bacterial dihydrofolate reductase, inhibiting synthesis of tetrahydrofolic acid. Folic acid is an essential precursor in the de novo synthesis of the DNA nucleosides thymidine and uridine. Bacteria are unable to take up folic acid from the environment (i.e. the infection host) thus are dependent on their own de novo synthesis - inhibition of the enzyme starves the bacteria of two bases necessary for DNA replication and transcription. Trimethoprim is commonly used in combination with sulfamethoxazole, a sulfonamide antibiotic, which inhibits the an earlier step in the folate synthesis pathway (see diagram above). This combination, known as co-trimoxazole, results in a synergistic antibacterial effect by inhibiting successive steps in folate synthesis. Its use has been declining due to reports of sulfamethoxazole bone marrow toxicity. Trimethoprim, used as monotherapy, is indicated for the prophylaxis and treatment of urinary tract infections (cystitis). Co-trimoxazole, owing to its greater efficacy, is indicated for a wider range of infections. For example, it is used as prophylaxis in patients at risk for Pneumocystis jiroveci pneumonia (e.g. AIDS patients and those with some hematological malignancies), as therapy in Whipple's disease and certain other infections.